Muffins are an easy and delicious breakfast or snack, and these Ginger Date Muffins are sophisticated, simple, and delicious. Ground cinnamon, ground ginger and freshly chopped dates are baked in a sweet and hearty breakfast dish. The simple yet sophisticated flavors of these Ginger Date Muffins will make them an instant hit, especially when served warm with melted butter and perhaps a drizzle of honey. 1) Preheat oven to 400°F. Line a 12-muffin tray with paper liners. 2) In a large bowl, sift together flour, sugar, baking powder, baking soda, ginger, cinnamon, and salt. Set aside. 3) In a separate large bowl, mix together buttermilk, egg, oil, and vanilla. Add to flour mixture; stir until just combined. Stir in dates. 4) Pour batter into paper liners. 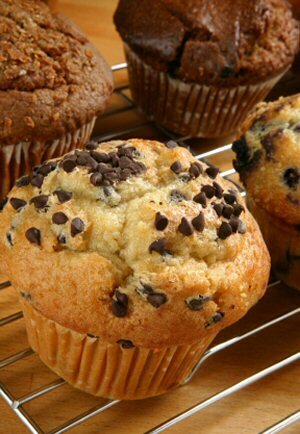 Bake 18 to 20 minutes, until a toothpick inserted in the center of a muffin comes out clean. Cool on a wire rack and serve.